It's not the most dramatic of tragedies. There are worse things to lose on a trip like ours: a passport, a bicycle, a leg. A missing cell phone is a minor hiccup, a privileged catastrophe. But still, it'll be a nuisance to sort out. I do not find Lauren's carrier back in the States to be a very good carrier. Verizon has a century-old instinct to monopolize; it resists openness and customer choice. There will be electronics shops on the road ahead, in Gobabis, in Maun, shops selling cell phones that will work with just about any carrier in the world. But not this one. We learn that a replacement for Lauren's phone will have to be purchased in the States, shipped from the States. We don't know how long it might take a cell phone to cross the Atlantic and find its way to southern Africa, nor do we know how quickly we'll be traveling. Coordinating our cycling pace with the pace of international commerce and customs inspections is a venture unlikely to go very smoothly. But there's little we can do at the moment. Koes is a tiny place. Cell phones are not sold here. Lauren takes a hurried ride around town retracing our steps while I tear apart the room. When she returns empty-handed, I walk the loop as she digs through her pack another time. Maybe, we both think, it's still hiding in there somewhere. It is not. Lauren's had bad luck so far keeping things on her bike. It can be tough on these bumpy roads. In the first week it was her cycling gloves. They were stuffed in her basket and fell out of her basket. In the second week it was an entire pannier, bouncing right off the bike. Fortunately I was biking behind her both of these times. But just on the way to Koes, Lauren was riding in back when a full five-liter jug of water fell off her rack. Neither of us noticed for dozens of kilometers; thankfully it was returned by a passing driver. And now, the cell phone, which ostensibly bounced through the small opening at the top of her pack, landed somewhere on the ground without either of us seeing or hearing it fall. These roads demand attention. Eyes must be trained ahead, scanning for obstacles. Ears are filled with the dull crunch of gravel, the clanging of rubber and steel against hard, uneven earth, rocks kicked up from the ground and loudly ricocheting off the aluminum of rims and spokes; or otherwise with music or podcasts pouring through headphones, distracting us from the tedium of the day's riding. And the body itself, it grows accustomed to a near-constant shifting of weight, of perpetual imbalance. In these conditions, it's easy for something to go missing. There's simply too much rough movement. We'll do what we can. Tomorrow, we'll go to the police station, just in case. We'll ask a few people, just in case. We'll even stay another day, partly to rest our tired bodies, but partly just in case. There are others at the hotel. We've met virtually no travelers since leaving the Cape, but here there's a whole group of them. They're up from Johannesburg on a hunting trip. We're told they'll have a barbecue this evening, so when the sky turns dark we wander outside to join them. They're a boisterous crew, already a bit drunk, but friendly. The couple who owns the lodge is there, too, starting the fire. They ask about our trip, and we spend a few hours chatting with the travelers and the proprietors. We're served some pasta with vegetables, and it's the freshest meal we've had in some time. It's a pleasant night, following a very long day, and we're exhausted. Soon, we head to bed. In the morning we walk to the police station. Lauren explains what happened and the officer nods in a polite but not terribly interested sort of way. He asks her to write a description of the phone on a blank piece of paper and says they'll ask around. We don't leave with very much hope. We do another lap around town. Everyone walks, and so it's easy to stop people along the way and ask if they've seen a cell phone on the ground. No one has, but most appear sympathetic and offer to keep an eye out. We go to the grocery, return to the hotel, and idle most of the day at a table on the patio playing cards. Come evening, the hunting crew returns. They are again inebriated and again gregarious. They join on the wooden benches and buy us a round of drinks. The night gets rowdy. We're ushered into the bar and handed shots. The men take turns walking behind the counter, grabbing liquor off the shelf, and making us cocktails. A wooden contraption comes off a ledge and we're offered snuff, loose ground tobacco. Ordinarily snuff is inhaled off the back of the hand. But this assemblage of polished wood, we're told, delivers a better hit. One of the men demonstrates. He lowers his head to the bar, resting his nose on a thin metal rod protruding from the device. Another man takes a hammer and hits the opposite end of the machine. There is a fulcrum between the two, a shallow see-saw. Like that carnival game to see who can swing a mallet the hardest, this impact sends the other end of the device quickly skyward, and a cloud of tobacco granules is sent rocketing up the first man's nostrils. He inhales loudly and grabs his face. His eyes glaze over in tears. We both decline a turn. We're pressured repeatedly, but there is too much face-grabbing and crying for this to seem worth a go. We defer politely, and the men continue passing the contraption around, alternating roles as giver and receiver of snuff. They offer plenty. Not just snuff and shots, but space on tomorrow's hunting excursion. They're off to shoot oryx and springbok, and would love for us to come along at no charge. We're sincerely touched by the invitation. But as a vegan and vegetarian, we apologetically decline. It's not our thing. They're amazed by this, unaccepting of our answer and our dietary choices. "When in the world will you ever be offered this opportunity?" they ask. "You simply must come." They persist and we resist, though the matter is never fully settled. They're nice people. At times, nice people can have opinions that aren't very nice. As the moon climbs higher and the embers of the fire grow bright, the conversation turns, as it often does with South Africans, to matters of race. There's consternation among the group about the direction in which South Africa is headed. There's a feeling, from many we've talked to, that the country is headed for civil war. There's legitimate dismay at the policies of President Jacob Zuma, to be sure, but much of what is said runs beyond mere disagreement with one's countrymen. We're told in frank terms that apartheid wasn't so bad for the blacks and the Coloureds of South Africa. There was free education, and free healthcare, and thus nothing to complain about, some in the group assert. A Bulgarian immigrant tells us that he considers himself more African than the Africans here, because it was his choice to live in this place. The Bulgarian has other thoughts. Several have other thoughts. They're broadly crass and repulsive and cast a dirty sheen over the earlier, lighter moments of the evening, and there's little value in repeating them. I do my best to listen, understand, and when able, interject, suggesting here and there that perhaps this policy or that action on the part of the apartheid government created a few of the problems South Africans were struggling with today. This opinion is not received well, and it is late anyway, so we go to bed with a slightly stiff farewell. One other thing happens before we sleep, though, its precise place in time lost within the fog of many tipsy hours. At some point, Elmarie, the friendly owner of the establishment, approaches Lauren with a smile. "I have good news," she says. "I think your phone has been found." We don't want to set expectations too high. We sleep well and wake, a bit hungover, and go about tidying up our room and tying together a clothesline for our laundry. There's a knock at the door. It's Elmarie, who tells us that a police officer is out in the lobby. We rush out and find two officers, one of whom is cradling a large phone in a pink case in his hands, green earbuds wrapped around its screen. It's Lauren's. In a small community, it's easy for word to spread. The police had indeed asked around town. Elmarie, kindly, had requested that her staff take word about the lost phone back to their homes the afternoon before. There were the people whom we told personally and, optimistically, the people whom they told. One of these hopeful avenues had led to the woman who found the phone on the ground, right outside the police station, two days earlier. The woman had wiped the phone of its data, replaced the wallpaper with a photograph of her daughter, and demanded a five-hundred Namibian dollar (about forty American dollars) reward, but all of this is a minor price compared to the energy and expense of getting a replacement. We happily hand over the cash, thank Elmarie for her hospitality and support, and leave Koes before another mishap strikes. From Koes it's 160 kilometers to the next town. The roads, of course, are awful, and the headwinds, as usual, are brutal, so we stop early and camp on the side of the road. We continue on the next day, through heat and clouds of flies, up and down sixty-two hills so steep and concentrated that the locals have counted and warned us about them. Again, we're physically and mentally exhausted by early afternoon, and Lauren in particular is not feeling well. We've made it to a busier road, a C road leading to the Kalahari Reserve, and so we hop a fence and camp a hundred meters away on the edge of a dry riverbed. Lauren's condition worsens. It's been a hard day and her stomach is in knots. In the early evening, she rushes out of the tent and vomits on the ground nearby. Her insides empty after the next few hours, bile and fluids and bits of bread reversing course and splashing out onto the sand. That night, she curls into the fetal position and rests, eyes closed, fighting chills and nausea and fatigue. There's little that we can do at the moment. I give her some ibuprofen. Her symptoms don't call for imodium or an antibiotic. Just water, which her body refuses to drink, and sleep, which doesn't come easily. In the morning, she feels a little better. Not great, but good enough to give cycling a try. We begin to pack up our things and load up our bikes when a truck crosses the riverbed and stops just outside the tent. A boer gets out. I greet him. "Oh, good morning," he says. "I was just curious who it was that was camping here on my land." "To establish the right of the first occupier over a plot of ground, the following conditions are necessary: first, the land must not yet be inhabited; secondly, a man must occupy only the amount he needs for his subsistence; and, in the third place, possession must be taken, not by empty ceremony, but by labour and cultivation, the only sign of proprietorship that should be respected by others." This land meets no such conditions. In the first genocide of the twentieth century, Germans seized central-eastern Namibia through the bloody extermination of over a hundred thousand Nama and Herero people inhabiting it. This man tells me, as I peer into the distance, that his farmhouse is several kilometers down the river. That seems like a lot of land for one to hold. And, of course, this is a dry riverbed. It shows no trappings of labor, other than the fence built to keep others out. I do not comprehend how one might come to own a river or believe they do, be it a river dead or alive. But my disagreement is with the concepts this man has been given, not the man himself. The man himself is agreeable and understanding. For one reason or another, our trespass is forgiven. He asks us to exit from the gate down by his house, so as not to stress the fence a second time. And while we're passing his house, he says, we're welcome to stop in for some water or anything else we'd need. It's appreciated, his offer. We've been moving more slowly than expected, and we can already feel the morning's headwinds picking up. He drives off, we follow shortly behind on our bicycles, and when we reach his house, we collect another five liters of water from his tap. We make it twelve kilometers. Lauren is still feeling weak and the winds are more ferocious than usual. We stop by ten and camp along the river again, this time on the other side of the fence, passing the next twenty or so hours reading, eating, and sleeping. It's still another eighty kilometers to Gochas on our fourth day since leaving Koes. We rise at dawn and pack in the dark while the wind slumbers. We enjoy three hours of smooth, easy riding before it wakes, and then battle it the rest of the way. It's tedious cycling. Wiped, Lauren's phone has no music or podcasts, just the thing to distract the mind on this type of straight, plain road. In solidarity I try to do without mine. At various points, I try to share, playing a podcast at full volume through the speaker. Over the wind and crunching gravel, even riding side-by-side, little can be heard. Eventually, we just take turns. We make it to Gochas, red-faced and sweaty, late that afternoon. There are two accommodations in town, a hotel and a guesthouse. We try the guesthouse first. It's a pretty complex of red mud walls and floral gardens and the most green grass we've seen since well before the Karoo. We're greeted by a young South African expat who offers us a room at four hundred Namibian dollars per person per night. Alas, it's about three times our daily budget. That's too expensive for us, we say. We ask if the hotel might be cheaper. The hotel, she says, is the same price. But then she asks if we have a tent with us. We say we do. We can camp, she posits kindly, for just 120 Namibian dollars per person per night. This does fall nicely within our budget. The camping rate comes with full access to the grounds, which includes shower and toilet facilities, an outdoor kitchen, a cool, spacious dining area with a fireplace, bar, couches, and tables, plenty of outdoor room, wireless internet that reaches our tent, and a small pool, albeit far too frigid for us to use. We immediately accept. We erect the tent. As I begin loading in our panniers, a dog scrambles through the other door. 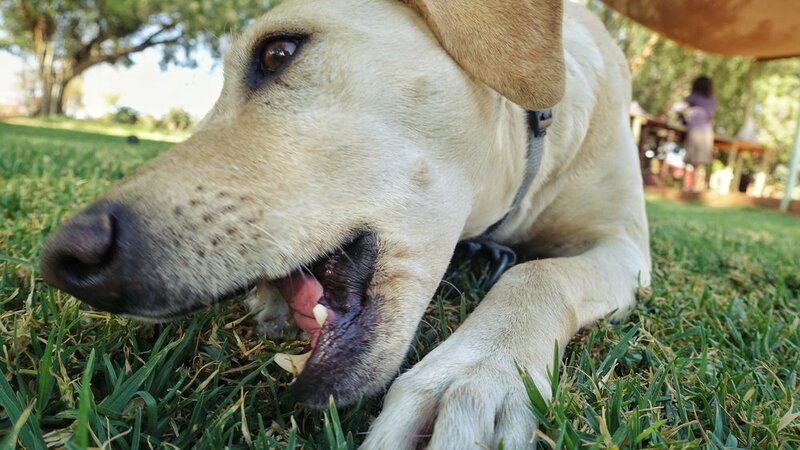 She's a quick, energetic canine, and she bounds around the small tent with vigor. Meanwhile, a tiny, adorable boy approaches outside and growls in as menacing a manner as he can muster. If this is the wildlife one must fear when camping in Namibia, one should not be too worried. We come to learn that the boy, Levon, and his dog, Molly, live here on the grounds. The child is the son of the guesthouse's owners. Elsewhere, a few other guests are staying the night. They're a group of four, sleeping indoors, having driven up from South Africa to visit family on a two-week getaway. They're warm and talkative and impressed by our journey thus far. One of them, graciously, buys us drinks from the bar and insists we join them for dinner. It's more appealing than what we had planned, some powdered soup and bread out by our tent in the dark. We accept and sit on one end of the long wooden table as a fire smolders behind us. Elize, the manager we'd met earlier, prepares a lovely meal: meat and salad and potatoes for the two couples, and for us, pasta and vegetables sprinkled with fresh basil followed by a dessert of kiwi and assorted fruit wrapped in handmade sugar cones. After days of peanut butter sandwiches and bags of chips, it's simply delightful. The couples ask some more questions about our bike ride. They inquire where we're headed and how long we'll be gone and how our tires have managed. They ask if we enjoy cool drinks, which we learn is maybe the Afrikkans direct translation of soda. We say, sure, we enjoy cool drinks. Toward the end of the night, one of the men walks off to his room. He returns with a shopping bag full of little bottles of soda and hands them to us. For your travels, he says. In the morning we walk to the grocery. We run into Marietjie, the mother-in-law of Karmen, co-owner of the guesthouse. Together, she and Karmen manage this market. Marietjie is a cyclist, she and her husband having discovered bikes later in life, and together they've been on a few bike tours through Namibia. She's interested in our trip and invites us over to her house anytime this afternoon to take a look at their bikes. We'd love to, we say. Where's your house? It's right next door. When we arrive later, we're introduced to her husband Flip and ushered into the sitting room of their beautiful home. They bring out a tray of coffee and juice and fruit and we get to talking. We talk for a while, the four of us. Okay, Flip says, would you like to see the bikes? We're given a tour of the garage, which is something of a shrine to the two-wheeled machine. 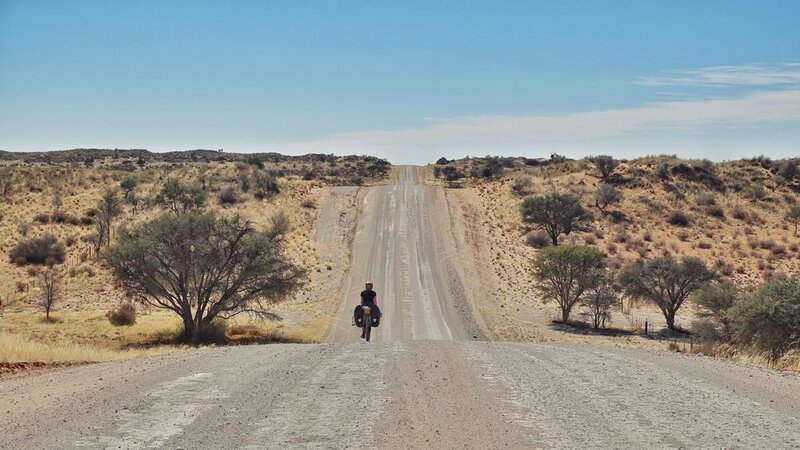 Three bikes stand proudly in the middle of the floor, two for the region's gravel and one lightweight model for endurance rides down in the Cape. It's a family of cyclists, Marietjie and Flip and their children, and the wall is adorned with dozens of medals from their various races and epic rides. Next, we're taken through the couple's garden. It's a sprawling oasis of green and life in an otherwise arid landscape. A passionfruit vine has engulfed a massive portion of the grounds, swallowing a tree and a fence and bearing the sweet fruit we'd been eating just inside the house. Elsewhere, dozens of trees sprout up at different levels of maturity. We walk quietly through patches of wildflowers and gargantuan succulents. The sun begins to set, casting a dusty amber haze over everything they've built. "So, you'll be staying for dinner?" Marietjie asks. Once more, we're touched by this flavor of Namibian kindness. Dinner is delightful. We toast over beer and wine to adventures and happy riding. Over a delicious salad (with avocado!) and plates of potatoes and mushrooms seasoned to perfection, we discuss our hopes for the trip and the coming months. We learn more about Flip and Marietjie and their wonderful family, the people and places that have made our time here in Gochas so memorable and rejuvenating. We'd planned to stay two nights in town, but on the second night we agree to a third. On the third, we agree to a fourth. I begin to lose track of how many days we've stayed, reading and writing and resting lazily on the grounds. One of these nights, I begin to feel unwell. Like Lauren earlier this week, I have an onset of nausea, chills, and fatigue. I retreat to the tent around six and struggle through a few hours of fitful sleep. Quickly a fever mounts. Bundled up in my sleeping bag, I feel a fire burning through me. I shed almost everything and then begin to tremble. Something doesn't feel right. I race out of the tent, stumbling in the dark to the toilets. They're ten meters away, just a bowl on a cement platform with a canvas roof and walls of bamboo reeds. I open the door, mind spinning and all strength leaving my legs. I collapse onto the cold concrete, lying my head on the smooth ground. I feel unable to move. A little time passes. Not long, but enough that I'm now freezing in the frigid air. I don't know what caused it, but over the next day I make frequent trips to these toilets, bowels emptying, body weary and unsteady. We've both fallen victim to gastrointestinal issues within the same short week. They're debilitating each time but nothing too serious, and I'm fortunate to have a little more comfort than Lauren during my recovery. If anything, it gives us an excuse to stay another day. And then, just for good measure, another. We spend time with Molly and Levon and have a few more lovely run-ins with Elize, the manager, with Karmen, with Flip and Marietjie. Our two-night stay has extended to five nights. On our fifth and final evening, a traveler arrives. The guesthouse hasn't housed another guest since our first day here, so we quickly strike up a conversation and get to know this new face. Christian introduces himself as a German diplomat based at the embassy in Windhoek. He's a soft-spoken man with a calm presence, returning to the capital from Koes. We sit outside talking for a few hours, and he invites us inside to join him while he eats a dinner Elize has prepared him. We busy ourselves cooking a less appetizing but still respectable pot of spaghetti and tomato sauce, then bring our bowls into the cozy common area. He's seated behind a plate of springbok loin and salad and a glass of wine. He offers us each a glass of terrific South African merlot. Our conversation continues, a deep meandering discussion of Namibian politics, American politics, German politics, and the logs on the fire behind Christian glow red, turn black, end at powdered grey. Kindly, our new friend (Elize informs us the following day that he's actually the German ambassador to Namibia) buys an additional bottle of wine for the table and we spend a few more hours chatting before he catches the time, remembers his early departure the next morning, and heads to bed. We return to our tent shortly thereafter. It's a cold night, but between the wine, the gratitude, and the lofty sleeping bags we're buried in, we're kept quite warm until daybreak. In the morning we are to leave, we do not leave. The evening before, Elize had mentioned something about a sushi night today. Her parents are visiting, Karmen will be there and her brother-in-law may stop by, a few additional guests will be staying, and, oh, there will be sushi. Vegetarian sushi, too. Would we like to stay one more day and join? We've spent each of the past four days looking for reasons to stick around the following day. Sushi and more time with these great people are worthy excuses. We don't need much convincing, and so our two-night break bleeds into a sixth, absolutely lovely night. Our bikes have become glorified drying racks for our laundry. We've now been on the road a little longer than a month. As far as months go, it's been a tough one. Since leaving our wonderful hosts in Cape Town, we've been challenged physically, mentally, and emotionally. We've put ourselves through more isolation, desolation, rough roads, hard days, arduous climbs, and stubborn headwinds than we'd bargained for. We've ascended over 27,000 feet in 1,400 kilometers of mostly brutal surfaces. We've crossed the better part of two back-to-back deserts without sustaining any human connections. At times we've been bored, frustrated, and hopeless. We've each gotten sick without a bed to rest on. We lost a phone. But somewhere in the middle of Koes, we crossed a line in the sandy road. Since then, things have shifted. Sure, the stomach bugs came later. The cycling has still been tough. 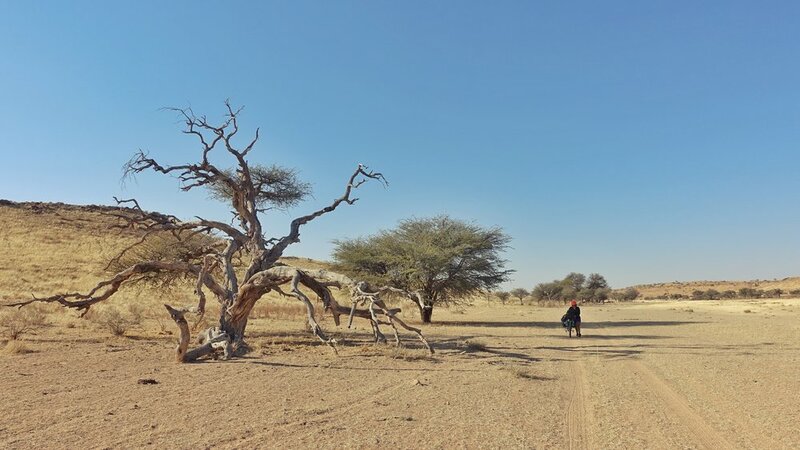 But here in the small outposts of the Kalahari, we've forged human connections that have warmed us to the bone. We've met tremendous, generous people who have given us compassion. Compassion and: rounds of drinks, delicious meals, a dropped phone, invitations into homes and hunting vehicles. Compassion and: engaging conversation, endless encouragement, caring curiosity. Compassion and: a bag of soda, a bag of fresh fruit, a bag each of sun-dried raisins to keep us nourished during our next leg. Compassion and: a view of the Kalahari though the eyes of those who call this place home. This is why we're traveling. Not to cycle fast but to cycle slow. Not to be given things but to be given hope, confirmation that the oft-maligned batch of humans that occupy this planet are largely good and kind. To find wonder not where it's promised in roadside attractions on the busy highway but, rather, where it's hidden in the textured fabric of everyday life, of simple places like Gochas, like Koes, like the small, resilient settlements that line the path from here to Botswana. From here to Egypt. From here through each continent of this big bright world on the whole, long way home.